Located in the foothills of the Himalayas, Rishikesh, known as the ‘Valley of Saints’, is a town in the northern state of Uttarakhand. Along with the pilgrimage town of Haridwar and the state capital Dehradun, it forms the nerve-centre of the booming tourism industry in the state. In fact, the geographical proximity of these three towns plays a significant role in attracting tourists from India as well as all over the world. Rishikesh attained international fame when the famous band Beatles arrived there in the 1960s to attend a session of Advanced Transcendental Meditation at the ashram of Maharishi Mahesh Yogi. Since then, it has become something like the yoga capital of the world, and is visited by thousands of foreign tourists seeking spiritual guidance and enlightenment. There are hundreds of ashrams and yoga classes and meditation centres that have sprung up all over this little town. This has led to rapid commercialization of this once quiet region as the supporting infrastructure in the form of hotels, restaurants, clinics, photo-studios, etc. has also come up rapidly. Rishikesh is well connected by rail and road, and people find no difficulty in reaching it directly or commuting from the nearby towns of Haridwar and Dehradun, as there is a frequent bus-service between them. Some of the most prominent landmarks of Rishikesh include the Laxman Jhoola and the Ram Jhoola. In this context, jhoola essentially refers to a suspension bridge which connects one side of the town with the other, as the holy Ganges flows serenely beneath. Cars and big automobiles are not allowed on these jhoolas, though one often shares space with other pedestrians, scooters, cycles and even cows! The jhoola offers a panoramic view of the river, the green forests and especially some of the ghats. Canoes, rafts and kayaks are a common sight! Crossing over the jhoola is akin to stepping into a different world. It is this part of town that is famous for little restaurants right on the banks of the Ganges and the ghats, serving all sorts of delicacies and at times, allowing the customers to discreetly smoke the widely popular and widely sold marijuana. Even though marijuana is illegal in India, it is still available, especially in ‘spiritual’ towns like Rishikesh, Haridwar, etc. This has led to the creation of a very mixed group of tourists, ranging from devout Hindus who worship the Holy Ganges or pray to the deities in the countless temples everywhere; the hippie crowd that stays on for months to meditate, learn yoga and indulge in smoking up; to the young students from towns and cities as distant as Delhi looking for a weekend away from their university. The small shops in the bazaar sell all items of utility along with all sorts of souvenirs. However, owing to its religious importance, alcohol and non-vegetarian food are legally banned in this area. There is no shortage of accommodation as it ranges from hostels and dormitories to luxury hotels and camp-sites. Depending upon one’s budget, a very comfortable and economical trip can easily be planned. Apart from the jhoolas, the most prominent tourist-attractions are the giant statue of Lord Shiva on the banks of the Ganges, and the soothing and vibrant Ganga-aarti performed by the sadhus at sunset, every single day, drawing thousands of spectators to this beautiful spiritual spectacle. Owing to it natural beauty, Rishikesh is a haven for photography-enthusiasts too! In the past decade or so, Rishikesh has also become a favourite hotspot for adventure-lovers from India and abroad. It is famous for bungee-jumping, white-water rafting, trekking, the flying fox and hiking, to name a few! At 83 meters, the bungee-jump in Rishikesh is the highest in India. The flying-fox arrangement has the distinction of being the longest one in the continent of Asia! Rishikesh is also the point of origin for a number of treks and hikes into the forests and mountains of the state of Uttarakhand, which is home to the ‘Valley of Flowers’, the Gangotri and Yamunotri glaciers (from where the rivers Ganges and Yamuna originate respectively), and the holy shrines of Badrinath, Hemakunth Sahib, Devaprayag, Gaurikund, Rudraprayag, to name a few. This is the common path tread by pilgrims and trekkers alike. Another supremely popular provider of adrenaline-rush is white-water rafting, as the Ganges provides rapids rated as Class 3 and 4. A Class 5 rapid is also present, though rafting from there is strictly regulated, unlike the others which are very popular with the tourists. One of the most common routes for rafting is the Marine Drive, a stretch of 24 kilometres from the higher reaches of the valley to the town of Rishikesh. One can indulge in jumping off from cliffs upto 60 feet en route Rishikesh while rafting! Shops providing the necessary equipment as well as guides and services can easily be found. For instance, the operator you choose for rafting will provide you a raft, helmets, life-jackets, the raft-guide and the conveyance to the origin of rafting. What makes Rishikesh’s tourism industry balloon are the nominal rates for most of such services, and the opportunity to bargain away to glory! Services are generally affordable and good. Rishikesh has managed to retain its spiritual pull inspite of the changes the region has undergone in the past few decades. It provides you with a heady mix of spirituality and adrenaline, depending upon what you seek. And chances are, you will probably find what you seek. Are you exhausted of your mundane routine? Do want a break from the traffic, the buildings and the city life? Is it that nature’s lap provides you the serenity and peace to enhance your desire to live? Then bask in nature’s glory by taking a trip to the splendid Toketee falls. Farmed by graceful columnar basalt are one of the most beautiful waterfalls in the world. These two-stepped falls cascade in a carved serpentine gorge, created by the north Umpqua because of the lava flow. This results in a well heighted cascade of 36 meters (113 ft.) in height – an 8.5 meters (28 ft.) upper tier plunging into a pool flanked by a deep alcove, followed by an 85ft. (85 ft.), Falls that splashes into a large pool. The Falls are located in East of Roseburg, Oregon, USA. It is about two and a half hours away from South east of Eugene and less than an hour from east of Roseburg, directly off Highway 138. These falls were christened Toketee in 1916, it is a chinook word which means graceful or pretty. This is one of the biggest attractions in Oregon, they are also the most photographed falls in this state. The falls not only attract tourists but artists who want to bring down on their canvas a sample of serenity and nature’s bliss. It attracts localites who seek to spend some time in peace post their busy daily schedules too. The aroma of fresh leaves rustling away to the melody of gushing water forms a graphic portrayal of nature’s picturesque painting created by the wondrous cascades of the Toketee Falls. Feast your senses to the divine blisses of nature; as this place truly is heaven on earth. The crystal clear waters descend from the basalt and drops into The North Umpqua River, where the river meets the clear river water. The flow of the Falls are controlled by a dam, less than a mile upstream that is part of the Umpqua hydroelectric project. A portion of the flow from the North Umpqua River is diverted by the 12 foot wood pipeline that runs along the parking lot toward Toketee Lake. This is a part of the North Umpqua Hydroelectric Project, a post-World War II project, that concluded in December 1949. The project still provides water from Toketee Lake to three generator turbines, which in turn supplies enough energy to power about 22,500 homes in Douglas County. This regulation also keeps the flow relatively stable the year round and the falls avoid the seasonal fluctuations of other creek-fed waterfalls in Oregon. The waterfalls are divided in two stages, the first stage falls 28 feet into a bower which are a little difficult to view. The most significant and eye-catching section is where the waterfall plunges over 85 feet into an exquisite rock lined blue pool. The falls not only gives you an opportunity to witness nature at nature at its best, but also experience it. The falls are a 0.7 miles walk from the parking lot. One would need a pair of sturdy shoes and a bottle of water to ease oneself during this pleasurable walk through the over grown woods ornamented with Douglas fir, big Maple leaves and Western Red Cedar. Photographers can capture every figment of nature’s bounty on this trail. The best time to capture the falls are at the brink of dawn, or just before dusk sets in. The light at this time is flawless for that immaculate click. The path is earthy and has a few pebbles and sand. The trail is a perfect amalgam of architecture and nature. It has several bucolic rocks shared with man-made stairs. The way is smooth and easy. Handrails are provisioned in steeper places to aid the elderly. However this cannot be accessed by the physically challenged. This could also be a little stressful for the elderly but every step of it would be worth taking. The falls are open all year round and one can go anytime barring the winter season. During the winters the trail could be hard to follow and snow shoes are required as the same gets slippery owing to snow and ice. One must stay on the designated trail, there are trails that diverge into viewing places from where the base of the waterfall can be seen, however this too can prove to be precarious. There are basic amenities like pit toilets and ample pave parking area. Though Toketee is the most beautiful fall it is not the only attraction that can dazzle you. Attractions nearby, could add to the adventure on your trip. These attractions are housed within the vicinity of four to eight miles. The adventures include Watson Falls, North Umpqua Trail, Slide Creek Falls, Diamond Lake and Crater Lake. This trip is both pleasant and exploratory. It is a pleasurable experience for one and all. It gives the younger generation an opportunity to understand the nuances and proceedings in the natural world. A vacation here will help you and your family to unwind and relax in the true sense. A trip worth taking during any season and at any time of the year. This trip will leave a positively lasting imprint on your mind in the years to follow. Capri, with its picturesque locales, natural architectural wonders, its colorful history, turquoise waters and bustling city is a traveler’s paradise. The Island of Capri is located in the Tyrrhenian Sea, in the Southern Italian region of Campania. There are numerous sightseeing avenues and places to explore in Capri, catering to all kinds of travelers. Blue Grotto or Grotta Azzurra is the most visited site in Capri. Its popularity and beauty have made it into an emblem of the island of Capri. Blue grotto is a sea cave with a depth of about 150m, and length of some 50m. These caves are illuminated from within by a blue light. The bottom of the cave contains underwater cavities. When the sunlight passes through these cavities and shines through the sea water the reflection that is created is blue in color. This reflection lends the blue color to the cave and consequently its name. Sculptures depicting Neptune, Tritons dating back to the age of Emperor Tiberius were recovered from the cave. The sculptures show clear Roman influences. The views within the Blue Grotto and around it are truly breath taking. Faraglioni of Capri is another popular tourist location. In Italian Faraglioni means stacks. Three stacks of rocks located off the Island of Capri make for a spectacular sight located within the blue seas. The three stacks are named Stella (109m), Mezzo (82m), Scopolo (106m). The road leading to Faraglioni is called Tragara. A walk down this road provides one with pleasant and scenic views. Arco Naturale is another tourist attraction of Capri. Also called the Pizzolungo, this is the only surviving remains of a once proper and large grotto. The arch that remains is also amongst some of the natural and scenic sites that Capri has to offer. The valley below the Arco Naturale has the Matermania Grotto. It could be reached by following a flight of stairs downwards from the arch. The Matermania Grotto is a natural cavern and makes all visitors wonder at nature’s marvels. Fern Grotto or Grotta delle Felci is another grotto located on island of Capri and popular among visitors. Mountain on the Island which also contains the highest point of Capri (at 589m) is known as the Monte Solaro. It is known locally as the “cloud catcher.” The mountain was named thus because of the phenomenon whereby thick fog or cloud like formations wrapped the mountain’s peak during dawn. Geographical reasons aside, this phenomenon adds to the overall beauty of the place and the sites that its peak provides. Marina Grande, Capri’s most prominent marina lies at the base of the mountain. The view from the summit is spectacular, as one can see clearly the Bay of Naples and on clear days as far as the mountains of Calabria. The Island of Capri appears as a charming city from atop Monte Solaro. The flora around the mountain and on the peaks includes colorful and vibrant plants such as ilex, myrtle, Daphne shrubs, orchids, narcissus, and heather to name a few. The flora adds a carpet of greenery and blossoms over and around the peak. There is also a statue of Augustus atop the mountain. All these factors add up to make it appear beautiful and photogenic. Around the Monte Solaro, near Anacapri, are located the ruins of Barbarossa Castle. These castles are dated somewhere between 10th and 12th century. Located on cliffs these dilapidated structures still provide an imposing site specially when viewed from far. It is not open to tourists regularly; guided tours are organized once in a while, so it should be enquired about beforehand by tourists who want to visit the ruins. A little while from the peak of Mount Solaro is the Cetrella. This Hermitage of Cetrella is also built on the edge of the cliffs. The location plus combined with the architectural styles of the structures make it a worthwhile visiting place. Dating back to the 16th century, the hermitage had some additions done to it during the 17th century. The hermitage of Cetrella includes a church and bell tower. The views around the hermitage have a quaint and stunning ambience about them. The pergola covered with wisteria, and the wooden benches located on the terrace give the whole place a rustic and charming outlook. These are by no means the only worthwhile sites in Capri. There are many other historically significant or naturally splendid places around the island. Some of them include Certosa Giacomo, Villa Lysis, Cimitero Acattolico, Casa Rossa to name a few. Casa Rossa was constructed in late 19th century, in 1870s. This vividly colorful house also contains archaeological findings, as well as painting exhibitions. It makes for a delightful visit. Villa Lysis has amazing gardens with rich flora that includes cypresses. The architecture and culture of the place harmonizes European and Modern influences. The villa was constructed in early 20th century. Other monuments and historical findings across the Island showcase the medieval, imperial as well as the monastic background and historical trajectory of Capri. Capri figures among the Greek Epics as the home of Sirens, who lured the sailors. The island has also been a favorite amongst European artists and authors during the 19th century and even later. The panoramic pathways, the vivid blue waters, the exclusive shopping experience, the glitz of the city life, the natural wonders across the island and the picturesque views all make this island of Capri within Tyrrhenian Sea a truly enchanting place. This entry was posted in History and tagged Capri, Island of Capri, nature on 26.08.2015 by admin. Rajasthan the land of colors and vibrancy is not only famous for its palaces, culture and customs but also for large varieties of delicious and world famous food. Rajasthani food is influenced by both the war like lifestyle of its inhabitants and the availability of ingredient in this region. Rajasthan one of the world famous state of India, makes outstanding name not only for its royal customs and rituals but also because of its heavenly delicious cuisines. The cuisine of Rajasthan is primarily vegetarian and offers a fabulous variety of mouthwatering dishes. The spice content is quite high in comparison to other Indian cuisines, but the food is absolutely scrumptious. Rajasthanis use ghee for cooking most of the dishes. It is said that a trip to Rajasthan is incomplete without experiencing the famous and delicious dishes. Dal, baati and churma is most famous dish of Rajasthan. The famous thali of rajasthan with dal, baati, churma is not only famous in india but whole over the world. Baati tough bun of wheat flour or millet flour which is very hard in shape and cooked over hot charcoal and ash and served with dal and loads of ghee (clarified butter). Traditionally this is accompanied by churma which is made of crushed baatis or rotis mixed with jiggery and ghee made of pure ghee. Dal, baati and churma is not complete the rich and delicious rajasthani thali rather ther are some other famous dishes like Ker ki sabji ( ker a common grown berry in the desert and sangria (a bean from the state tree, khejri) are used in pickles and dried vegetables dishes and are popular in both urban and rural areas, Khadi is made of yogurt and besan and added flavor given by tej pata (leave), which gives a perfect smell lashun or mirchi ki chutney (Garlic chutney) with dried kachari (wild growing ccumis) and red chilies is a fantastic accompaniment to all of these. Another popular dish Bajre ka Kheechda ( a gruel of crushed millet, served with brown sugar and ghee is a regional delicacy, it is an easy to digest made from rice and lentils. This is a very delicious and a popular dish of india. In spicy foods rajasthani palate has The traditional tasty curries like Gate ki sabziwhich is made of dumplings of chickpea flour in a thick spice laden gravy and badi ki sabji is quick to make and it is very delicious. It is made by using daals like moong, urad and chawli with large amount of butter pouring. other rajasthani curries like kicha ki sabji, guwar fali ki sabji, beans and ker sangria ki sabji, rabori ki sabji, haldi ka saag, kadhi with chhach and pappad. All these together makes the heavenly delicious rajasthani thai complete The rajasthani thali is the most perfect and amazing treat to all guests in the rajasthan to experience and realize the deep and rich taste of rajasthan. It is also known for its snackes like bikaneri bhujjia, mirchi bada and pyaaj and mogra kachori. Snacks in rajasthan vary from deep fried samosa, pyaz ki kachori and mirchi bada to lighter bhujjia. Every snacks has a distinctive flavor and texture, to suit everyone’s palate. Each region of rajasthan has its own special distinguished food item that is identified with the town and city. like jodhpur ki mawa kachori, alwar ka mawa, pushkar ka malpua, Bikaner ka rasogulla and jaipur ka ghevar. Malpauas from pushkar and Rassgollas from Bikaner. If you travel from one part of state to another you will find that every region has something different and unique delicious food items. Some of examples like The cuisines of Jaipur in peculiar is influenced by the lifestyle of the Maharajas and Maharani of Jaipur. Cuisines of Jaipur includes all the Rajasthani food which is cooked only under Desi and pure ghee which specifically describes the richness and dignity of Rajasthan. The one who is still untouched with the cuisines of Jaipur is surely missing out the big thing. Jaipur which famous for mainly its rabdi ka ghevar it is also famous for dal ki kachodi, tinde ki sabji, kadhi,mirchi ki pakaodi and its delicious curries. If you are a Rajasthani thali connoisseur, you must try the one served at Chokhi Dhani, about 22km outside Jaipur. Dinner begins with garlic chutney, jaggery, and the famed choorma and famous lapsi made of grains. The rotis are made of millet, barley and wheat, and served with ker sangri pickle, gatte ki sabzi, khato (a tangy chickpea flour curry in buttermilk) and many other dishes from the countryside. In jaipur Suvarna mahal at rambagh serves one of the best thali. The appetizer includes vegetable kababs and barbequed lamb. Jodhpur is also a popular destination of sweets and spicy savories. Jodhpur has its famous mawa kachori (kachories puffed breads with stuffing those with mawa) being extraordinarily sweet while others have biting hot green chilies laced with a masala that is also intended to singe the palate. a number of delicacies have originated in jodhpur like makhaniya lassi, mawa and pyaj kachori, hot and spicy mirchibada, lapsi, all these dishes are very delectable and world famous. In proportion of rajasthani culture, every meals in jodhpur starts with sweet ladoos and scandalously delectable dal baati and churma. The meal is topped with giant amount of ghee thus one can have a meal fit for maharaja. besan ki chaki, mawa kachori and panchkuta are the famous sweets of jodhpur. Udaipur famous for its street food items like papdi chaat, dahi chaat, vada paav and sev chaat. Alwar city famous for its kalkand (milk cake), kalkand is the most delicious dish made of milkthe demand of this dish all over the world has offered alwar a unique name in the world. The food items that could last for several days made in Bikaner. Bikaner cuisine comprises a nutritious palate of dish such as gatta ki sabji, pakodi, pappad, khata. The cuisine of jaisalmer is very traditional and mirrors the wealthy cultural legacy of the state. One can find a broad selection of delectable jaislmer dishes the taste buds of all age groups. The cuisines made of a lot of red chilies and other spice, a few of the most delicious dishes of jaisalmer are bhanon aloo, kadi pakora and ker sangria. 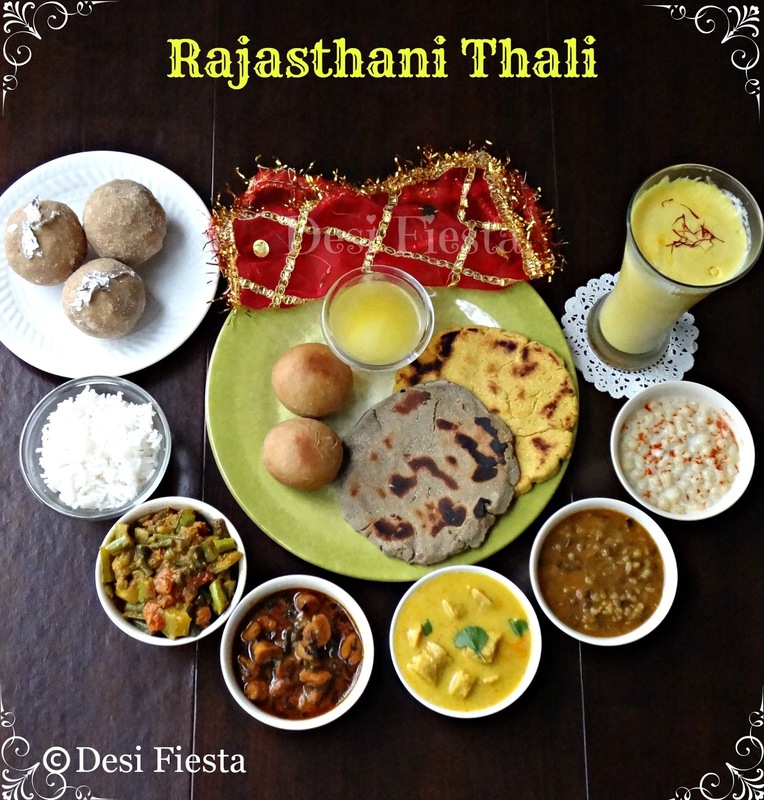 Rajasthani food is also famous for its delicious and mouth watering sweet dishes which are not referred as dessert in Rajasthan because these can be taken before or after the meal. Famous sweet dishes of rajasthan includes churma, gujja, seero (halwa), Nukhati, imarti, feeni, besan, balushahi, makkhan bada, mawa and kadka. Some other famous sweet dishes like Kalakand also known as mishri mawa made out of solidified, sweetened milk and cottage cheese, Besan ki chakki traditional Rajasthan sweet made of gram flour, usually made on big occasions like weddings or on festivals, Moong dal ka halwa is a unique sweet dish of lentils sweeten with milk, ghee and sugar, It is generally made in winters because it is supposed to keep body warm. This dish is not only famous in rajasthan but all over india. Another famous sweet dishes are ajmer ka sohan halwa, Ghevar, it is a delicious Rajasthan sweet, consists of rounded cakes of wheat flour with pouring of sugar syrup and rabdi. It is famous for its matchless sweetness comes in varieties such as plain, desi gheeand mawa. The demand of ghevar remains high during teej. For non vegetarians mohan maans which is cooked in milk, laal maans meat in red chilly curry, safed maans meat cooked in curd, bajri ki raab and khad khargosh wild hear cooked and roasted underground. Don’t be serious if you find a big bowl of striking red curry. Its call laal maas. Traditionally it prepared post hunting. The gravey is supposed to extremely spicy and delicious. For non vegetarians handi is the best place. It serves tender mutton cooked in traditional pots and smoked with burning charcoal along with wafer thin roomali rotis. The list of rich and delicious food items of Rajasthan palate has no end. If you are on rajasthan trip and if you tried all these lazzeg dishes you will always ends up licking your fingers. Your tummy will scream “No more !” But you won’t stop !!!. so go for Rajasthan delicious food whenever you have plan to visit Rajasthan. Remember Gladiator, the movie? Remember the huge amphitheater where Russell Crowe finally finds peace? Now, take that to a bigger, grander scale. A scale which no man can ever hope to achieve. A scale where we are left with only awe and respect. Welcome to Haiku valley – nature’s own amphitheater! Situated near the Koʻolau Range behind Kāneʻohe, Oʻahu in the Hawaiian Islands, the valley is known for its recently refurbished Haiku stairs, also known as the ‘stairway to heaven’. The valley was also a site for the US Navy radio transmitting station. The 4000 step stairs were originally meant to reach the radio antennae located on the surrounding ridgelines. The ridge is horse-shoe shaped and is therefore was of strategic importance to the navy as the ridges allowed for excellent communication with ships as far as the Tokyo Bay. The facility was originally built in response to the attack on Pearl Harbor and it used to be a classified military secret. It was then the world’s largest radio transmitting station and during the war, it proved its worth. It became the central hub for communication with the submarines in pacific and played a key role in coordinating attack formations among them. Little is remembered of the pain that the constructors took building this communication base. Harsh decisions were taken after the Japanese attack on Pearl Harbor and pace of construction was doubled to match the wartime needs. Cables had to be mounted between ridges and posed many engineering challenges. The construction itself is a testament to the wartime construction capability of the US navy. Their success in the pacific is often attributed to the communication base In Haiku as it was the only base that was capable of communicating with any ship or submarine anywhere in the mighty Pacific Ocean. Today, however, the hype surrounding the valley is because of the ‘stairway to heaven’ which is officially called Haiku staircase. The reason why it is so popular today is because one: hikes there are really awesome and two: because hikes are not allowed there. But hikers seem to find ways to bypass the not-so-strictly-held law and experience the awesomeness anyway. The amazing sceneries and the thrill of looking over the sides at the sheer drop offs are totally worth the risk. Most hikers are said to repeat the words “unreal” in their heads and constantly thank the constructors for providing side rails while making the climb. The climb itself, however is not very difficult. The only thing to look out for will be the low key security guard and your footing, which you wouldn’t want to miss in any case. The best time to make the climb is early in the day because one: the sunrise will be amazing and two: because you can hope that guards actually sleep then. One must admit, the thrill of making the climb undetected and unseen calls the inner child in us and adds bonus points to the whole idea of making the climb. Climbing a 4000 step stairs to the top which is 2000ft above sea level is not for the weak hearted or the unhealthy though. It would probably restart your cravings for those burgers from McDonalds’. So the best thing to do before going there for a hike is to pack some (possibly healthy) food and make sure you have enough muscles in your thigh to survive the climb. The stairs have platforms in between where the climbers can rest and catch some breath. The staircase is very narrow, however, and one has to step over the rail to make way for people coming the opposite way. For the entirety of the climb, the only thing visible at the top are the clouds which look so thick they threaten to engulf the rest of the planet. This gives the feeling of actually climbing a staircase to Asgard (or any other interpretations of heaven) between the clouds. After you reach the peak, you get to behold the antenna that served the American Navy during the Second World War. It has an eerie beauty attached to it in spite of it being a not-that-well-maintained dish of metal because the awe-inspiring stories of the long fought war rings in your head and all you can think about are the people in the submarines near Japan nearly 50 years ago whose only point of contact with the rest of the world was through this slightly grumpy looking metal antenna. Tear your eyes away from things made by man and Mother Nature, as always, fails to stay modest and humble. To the north the majestic Kaawa becomes visible. The contrasting sea adds to the beauty and you start feeling you could stay there for the rest of your life. Muster enough energy to turn south and chances are you begin drooling again. The amphitheater shaped valley becomes visible and you can see the three peaks of Mt. Olomana on the left. Sea to the north and valley to the south. Choose. Once the clouds clear, you can get a very clear view of the highway that cuts through the mountains and the tiny cars on it from your vantage point. After feeling like a king or a god (or a god-king) you have to make the climb back down among the mortals. The climb down is not bad because you know you are going to hit the ground sooner or later (jest intended). Once your feet hits solid ground, all that remains with are the sweet memories of having touched the clouds and the experience of having risen above the mortals. The memory of having felt like the king who would watch over the daily game of life happening in the valley below in Nature’s own amphitheater tends to stay at heart forever.